Hey folks! Hope you had some awesome Easter Holidays! I was back home in Germany, choking on chocolates, which also explains why it’s been a bit quiet in my sewing corner. In my defense, I have made a couple of things, but haven’t photographed any yet. Which is also partly due to my current obsession with book binding. Yeah, you’ve read right. I’ve discovered a new hobby (I am a hobby collector!) and, as always, am obsessively spending every free minute with it. 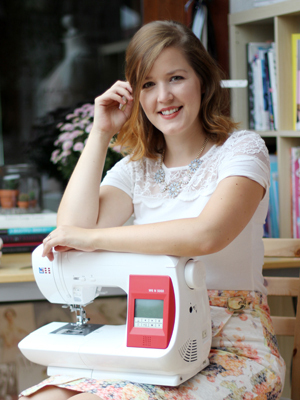 No worries, my heart still belongs to my sewing machine. 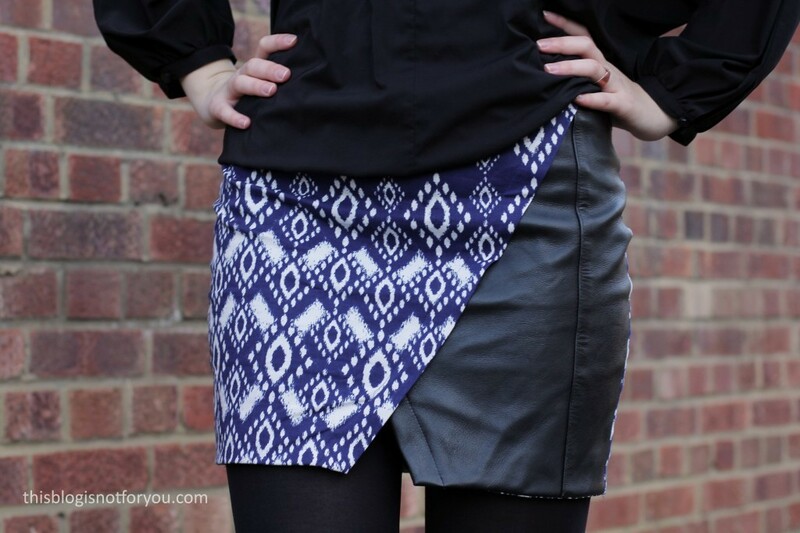 I’ve made this Nascha Skirt a while ago, but was too lazy to sort out and edit the pics. The Nascha Skirt has always been on my to-sew list since I came across Named patterns and I bought the pattern a little while ago. The pattern was a bit tricky to work with. 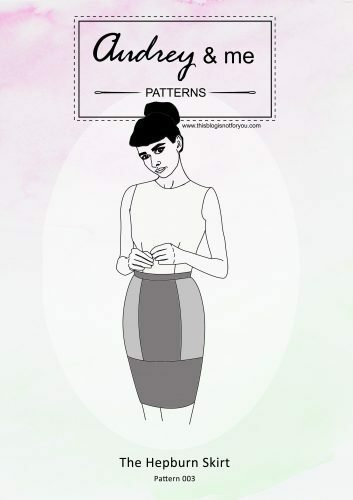 I downloaded the PDF pattern and thought it wouldn’t take too long to assemble a skirt pattern. For some reasons the different sizes are not nestled, which means you won’t find all sizes on one pattern sheet. The sizes are grouped (EUR 36 & 38, 40 & 42 and so on). Unfortunately I had to grade between 36 waist and 38/40 at the hip, which made it really difficult to work with this pattern. I had to print off and assemble both sheets (36/38 and 40/42), cutting out the patterns pieces and layering them for grading. Annoying and time-consuming. 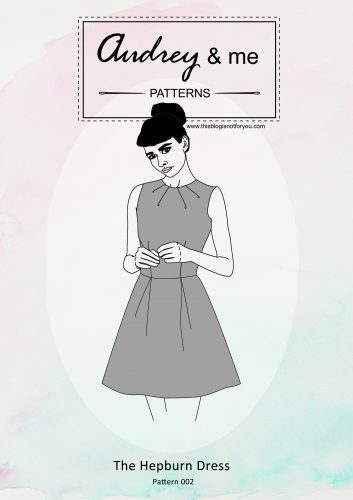 The rest of the pattern was fine, but I was quite disappointed that the pattern wasn’t very pear-shaped-lady friendly. 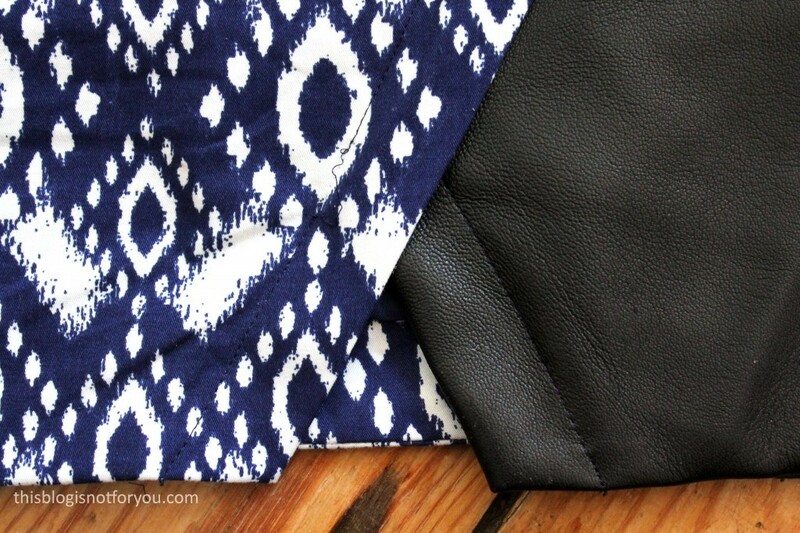 I bought the blue & white aztec print fabric in Birmingham at last years blogger meet-up. I only bought 0.5 metres of it as I wanted to use it for a very simple mini skirt. 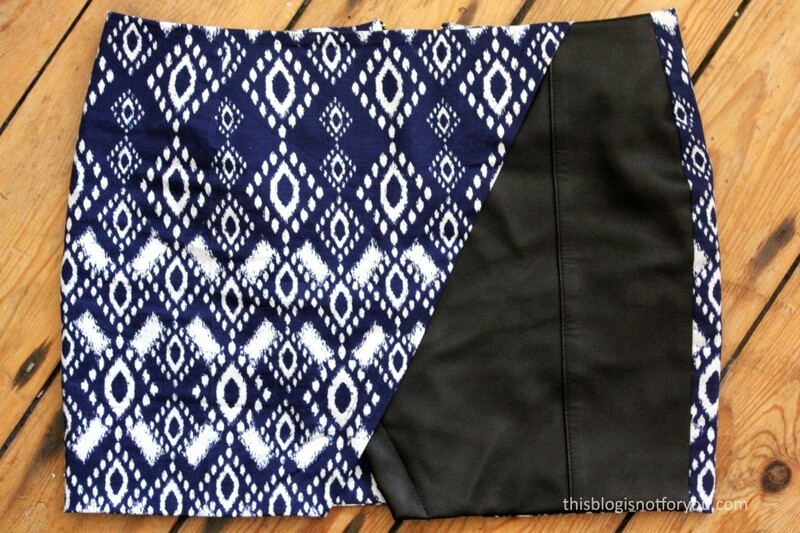 The Nascha Skirt pattern recommends using more fabric, but I was determined to make it work. With a little bit of squeezing it would have been enough, but I had the idea of adding a contrasting panel. I had leather left over from my last skirt refashion. The leather pieces weren’t large enough so I had to work with what I had and had to integrate one of the seams. 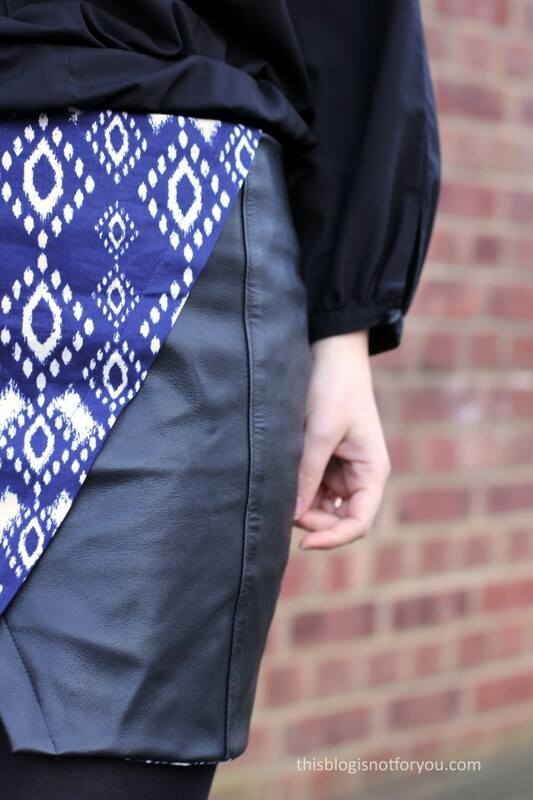 The aztec print is a stretch-cotton sateen and worked really well with the leather. It was easy to sew with. The only tricky bit was hiding the facing as I couldn’t press the leather. It still shows a bit, but I don’t mind it that much. I used a golden exposed zip in the back. 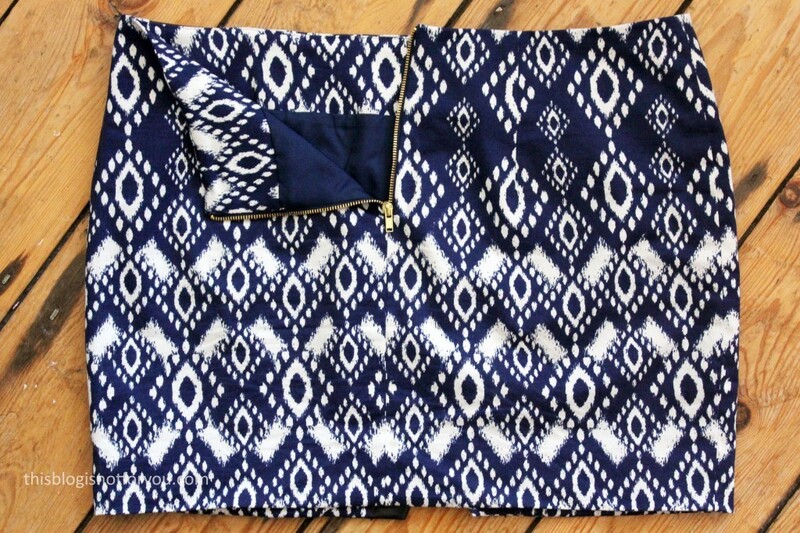 For some reason I have never really used exposed zips. I am quite an expert now on inserting invisible ones, but I was a bit nervous about the exposed zip. It did work out better than I expected and I quite like the golden contrast. The fabric bits of the zipper are navy and match the fabric, so you can only really see the metal bits, which I really like. 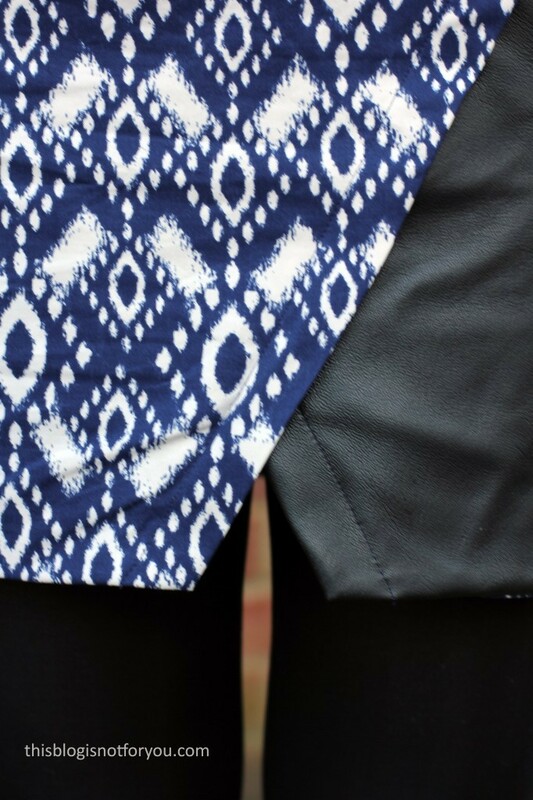 Here’s a close-up of the front detail of the skirt. I was a bit worried that I wouldn’t be able to hide my modesty, but it was fine in the end. The skirt is still really, really short though! 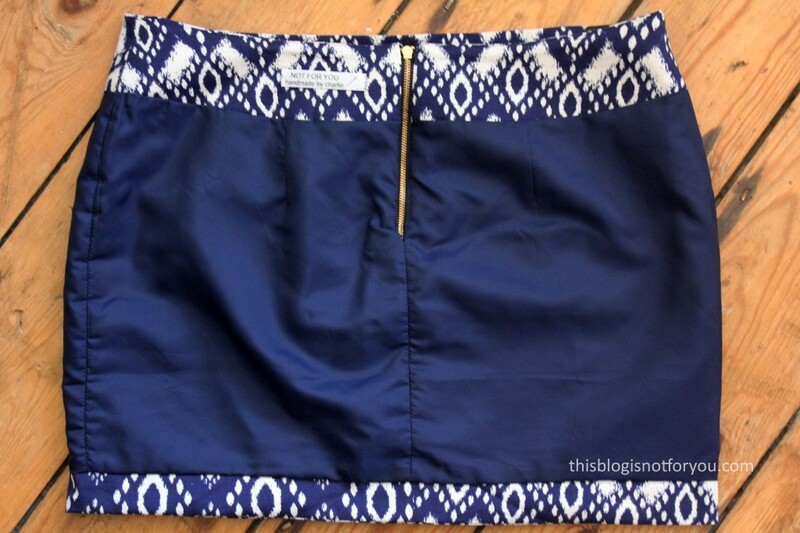 The skirt had both facing and lining and I how it looks on the inside. Almost pretty enough to wear it inside-out, non? I lined it with navy blue polyester fabric, from my vintage stash. Guess what happened the first time I wore it? The top-stitching at the front detail ripped. I kind of expected this to happen and was very careful, but apparently not careful enough. When I crouched down to pick something up, the seam tore. The topstitching is only decorative, but it annoys me anyway! I love mini-skirts, but this one is so short that I can’t wear it at work for example. I normally don’t dress up a lot at home, so this one won’t see the daylight too often. 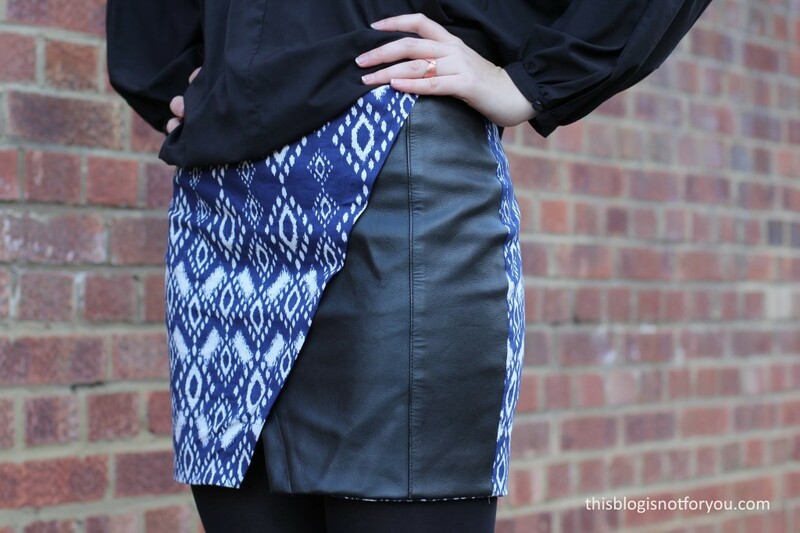 I love the design of the skirt, but for now one is enough! Have you ever used a Named pattern? Love the leather panel. Very cool. What a shame about the stitching popping though!